San Marcos, CA, August 12, 2013 – Audience today announced that its top of the line Au24 SE cables are now available in speaker cables, interconnects and power cords. 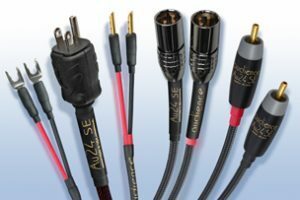 Delivering a major step forward in musical accuracy, the expanded Au24 SE lineup includes speaker cables with spade lug and banana plug terminations, interconnects with RCA and XLR connectors and power cords with U.S. and European Schuko AC plugs. Audience Au24 SE cables have been upgraded from previous models with ultra-low-mass, high-purity copper connectors that enable the passage of more low-level information in phono, line-level, speaker and power cord applications. The Audience Au24 SE lineup is now available in all new cables. Please consult Audience or an authorized Audience dealer for pricing. Owners of Au24e and Au24 cables can have them upgraded to Au24 SE at prices ranging from $220 to $440; please consult Audience or an authorized Audience dealer for pricing. The Au24e speaker cables, interconnects and power cords will remain available. Posted in Announcements, Au24 SE Cables, Cables, Press Releases.